A radical new way of making structures visible at the nano level has been developed at Johannes Gutenberg University Mainz (JGU). This new method makes it possible to determine with precision the arrangement of atoms and molecules in a diverse range of materials from cement to pharmaceuticals. The procedure, which is still in its infancy, comes from the field of electron microscopy and can resolve the structure of the tiniest crystals. The method was developed by Dr. Ute Kolb's working group at the Institute of Physical Chemistry at Mainz University and is now receiving international attention. In cooperation with researchers from Spain and China, the method has now allowed the structure of a new type of fine-pore zeolite to be established, a study that the journal Science published in the end of August 2011. "We have opened a door to the world of nanostructures," is how Dr. Ute Kolb describes her working group's success. The arrangement of atoms and molecules in a solid has a decisive influence on the physical properties of that material. Such structures were analyzed for the first time back in 1895 using X-rays, a method that has since become a standard procedure. The beginnings of the research in this area included the discovery in 1912 that crystals are made up of small grids, a characteristic that is responsible for the diversity of thermal, electrical, visual, and mechanical properties found in such substances. "The fact that this method had and still has a huge influence on our understanding of solids and their properties is reflected in the number of Nobel prizes awarded on the basis of structural analyses," says Kolb, describing the success story that is X-ray structural analysis. In the age of nanotechnology, however, science is focusing increasingly on very small particles, which can no longer be captured by way of X-ray structural analysis. For example, an X-ray structural analysis of a single crystal is only possible up to a crystal size of around 1 micrometer, i.e. one thousandth of a millimeter. Below this threshold, in the sphere of nanostructures, electron diffraction tomography or automated diffraction tomography (ADT) allows scientists to make a similar determination of the structure of individual crystallites for the first time. "It is as if we have switched on a light in the world of nanostructures," says Kolb. As is the case with electron microscopy, the method is generally based on the concept of an electron beam being directed at an object and diffracted as a result. The diffraction behavior allows the location of the atoms to be established. Together with her working group, Kolb has developed single-crystal electron diffraction tomography, to give it is full name, over the past 10 years. They had their first major success in 2009 with the determination of the structure of barium sulfate. "Since then, the number of materials whose structure we have been able to uncover has exploded", comments Kolb. The most recent example is the determination of the structure of the zeolite ITQ-43 in cooperation with Spanish and Chinese scientists. Zeolites are crystals that are created from a compound of aluminum and silicate. They have small pores which makes them interesting for the field of energy and environmental technology because of their potential use as adsorbers, ion exchangers or catalysts for example. In water treatment, they can help to filter out heavy metals; in the oil and gas industry, their introduction was like a mini revolution for crude oil cracking. We also encounter them in our everyday lives, in washing powders for instance. Professor Dr. Avelino Corma and his team of researchers from the Technical University of Valencia synthesized a zeolite with small and medium-sized pores, the combination of which acts like a funnel, thereby enhancing its catalytic properties still further. How the complex crystal structure was analyzed using ADT is described by the team of researchers in their recent article in Science. 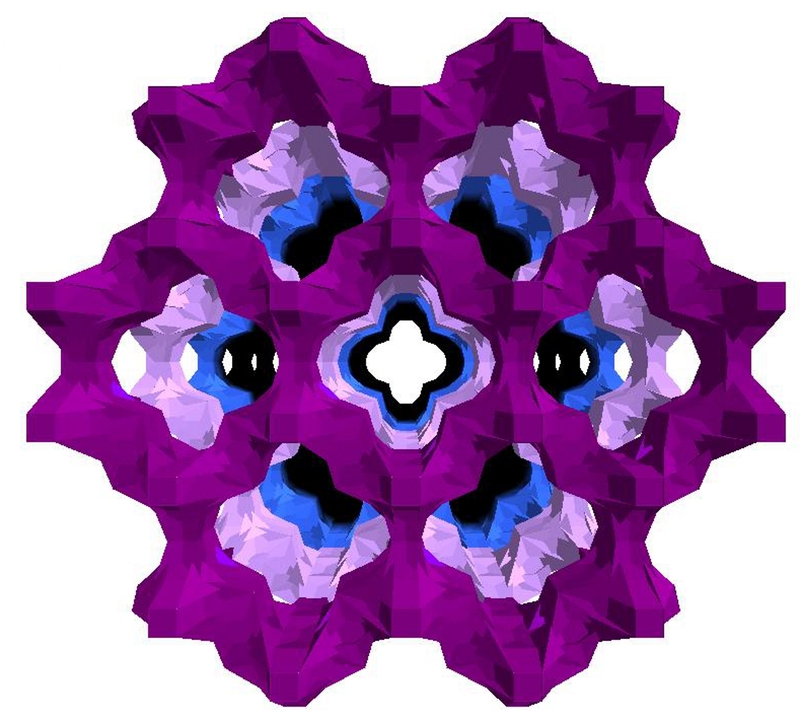 "The smaller the zeolite crystals are, the higher their catalytic efficiency," explains Kolb. With crystals the size of around 100 nanometers, which is similar to one eight-hundredth of a human hair, automated diffraction tomography is often the only way by which the structure can be fully and clearly resolved. "There is a large number of natural and synthetic solid materials for which our method may be used – materials which are not available or cannot be manufactured in a suitable crystal size." So, over the past two years, Kolb has placed a wide range of materials under her microscope, from color pigments and titanate used in solar technology right up to minerals like charoite, a precious Russian gemstone. In comparison with conventional electron microscopy characterizations, electron diffraction tomography is considerably faster, more accurate, and more complete. Whereas before, structures were researched for two years, using ADT a result can be obtained within just one day. Even beam-sensitive materials are, in principle, suitable for the method, which Kolb describes as "computer tomography for crystals". ADT also shares a characteristic with computer tomography that has played a major role in its success: the experimental sample under the electron microscope is gradually tipped over in order to gather data from a wide variety of different positions. Using this trick, scientists can avoid the key problem found in this area: the strong interaction of the electron beam with the sample has, up to now, made the electron diffraction much more difficult. Since 2008, Dr. Ute Kolb has been Senior Lecturer at the Institute of Physical Chemistry and at the Center for High Resolution Electron Microscopy at Mainz University, concentrating on the field of electron crystallography. She presented her most recent work at a conference in Madrid in August 2011, where she was also elected to the Executive Committee of the Commission for Electron Crystallography of the International Union of Crystallography. In order to advance the development of the method, the Mainz-based chemists are collaborating with Professor Dr. Elmar Schömer of the Institute of Computer Science as well as with Professor Dr. Thorsten Raasch of the Institute of Mathematics at Johannes Gutenberg University Mainz.